Reliable, high speed Internet and ‘phone connectivity is as important as the space itself. When looking at a prospective office, City Voice can run a whole market Connectivity Survey, highlighting carriers that service the space, monthly costs and standard lead times. is the longest lead-time of all. City Voice can help get services ordered early and if necessary, provide temporary options where lead times go beyond a preferred move date. 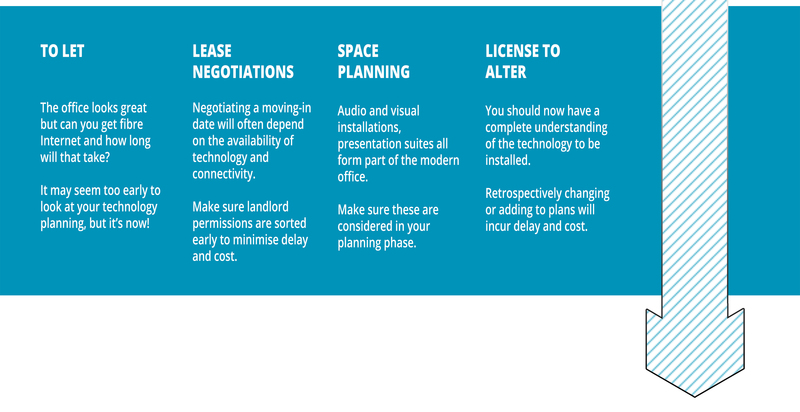 As part of the move-in negotiation process, Landlords seek information about the changes a tenant proposes to make to their space. These requests, once agreed are formalised in a License to Alter document. 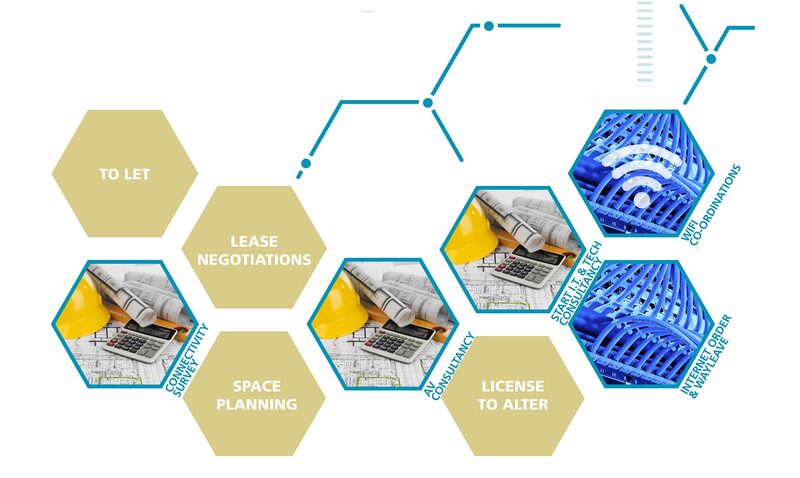 All too often, during this important pre-lease process, technology requirements are not captured, leading to costly amendments and separate Wayleave agreements to gain permission to install equipment and service. Any additional legal process takes time and will lengthen lead times. City Voice, if engaged early, will be able to guide you on technology touch points. 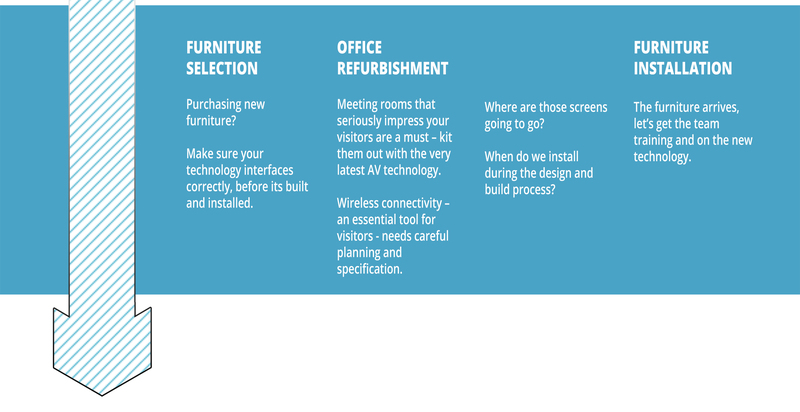 Open plan desks and offices allow the team to work, but will the space be an effective client meeting space? Will the breakout areas provide the right balance between relaxation and motivation? Increasingly, offices are effective work environments and social spaces, changing personality based on the time of day and day of week. Audio Visual technologies are vastly important in managing meeting rooms, event spaces and background music. City AV Solutions are able to help define how these spaces are built and managed. 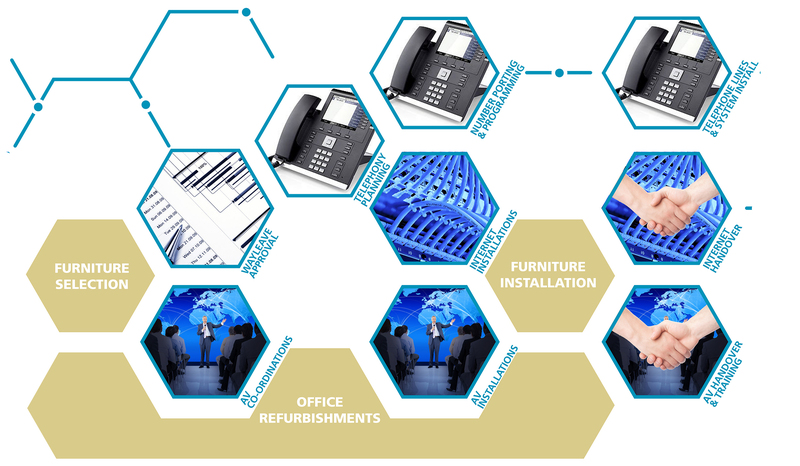 In addition to getting the aesthetic environment right, communication equipment, services and audio-visual technology must be integrated with the build process. Design and Build contractors work at a fast pace and ensuring technology components interface efficiently requires a safe pair of hands. City Voice are just that. An office move is an ideal time to assess a communications strategy. Technology advances at a fearful pace – what was considered best practice a few years ago may no longer be so. City Voice’s experienced Consultancy team can assess your needs, match these to your current technology and make strategic recommendations for your business. Leaving aside the other processes involved in getting an office ready, from a technology perspective, you want to work in the old office until the day of the move, transitioning seamlessly to the new office without a hitch. This is what we do. Working closely with all stakeholders, our PRINCE 2 Project Managers handle the implementation with care. What’s more, each project has an assigned Director, responsible and reactive to any quick decision making in the interests of the project. After a successful move, businesses need the reassurance that there’ll be a continuation of support, ensuring the Technology is fully maintained, warranted and above all, used, in order to return on the investment made. Our expert technical teams are on hand to support you ongoing, responding efficiently to requests from their Central London base. Additionally, as the business grows, City Voice and City AV Solutions can re-engage, ensuring technology keeps pace. Why not get the experts on your side to help ensure a smooth transition for your office move and give us a call today? Alternatively, click below to download a PDF version of the The Office Movers Journey.